Av. Alma Mater, Ciudad Universitaria, D.N. de Sto. Dgo. 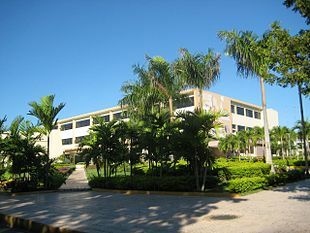 The Universidad Autónoma de Santo Domingo (UASD) (Autonomous University of Santo Domingo) is the public university system in the Dominican Republic with its flagship campus in the Ciudad Universitaria of Santo Domingo and with regional campuses in many cities of the Republic. It was founded by Jose Gabriel Garcia and Emiliano Tejera in 1866 as the Professional Institute, replacing the former Universidad Santo Tomás de Aquino, one of the first universities of the Western Hemisphere (Americas), which was founded unofficially by a Papal bull in 1538, officially by royal decree in 1558, and closed in 1822. It was later renamed University of Santo Domingo in 1914. In structure, the school followed the model of the University of Alcalá de Henares. The university organized its offerings into four schools: Medicine, Law, Theology, and the Arts. Today, the University has expanded to eight schools: Humanities, the Arts, Law and Political Science, Health Sciences, Economics and Social Sciences, Science, Engineering and Architecture, and Agricultural Sciences. The University traces its foundations to a Dominican seminary established in 1538. This was raised to the status of a university by the Papal Bull In Apostolatus Culmine, issued by Pope Paul III on 28 October 1538, and granted the same rights and powers as the Spanish University of Alcalá de Henares. It was initially organised in four faculties, following the pattern of medieval European universities: Theology, Law, Medicine and Arts. In 1801, the university was suspended due to the Haitian occupation; it reopened in 1815 after Spanish colonial rule was restored under the rectorship of Dr José Núñez de Cáceres. However, it was forced to close again in 1822 due to the conscription of its students. After the Dominican Republic was established in 1844, an attempt to reopen the university was made by President Pedro Santana in 1859, but this was unsuccessful. In 1866 the Instituto Profesional (Professional Institute) was created by Jose Gabriel Garcia and Emiliano Tejera in Santo Domingo, providing higher education in the city. This was closed in 1891 but reopened in 1895. On 16 November 1914, President Ramón Báez (who was also rector of the Institute) raised it to university status under the name "University of Santo Domingo". This new university was forced to close by the US occupation from 1916 to 1924. 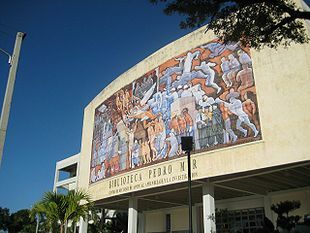 After the start of the dictatorship of Rafael Leonidas Trujillo in 1930, the university was unable to operate independently; it was only on 31 December 1961, after Trujillo's death, that a law was passed restoring its autonomy. The Humanities Faculty is formed of the Schools of Social Communication, Philosophy and Anthropology, History, Foreign Language, Literature and Psychology Schools. The Agronomy and Veterinary Sciences Faculty is formed of the Schools of Agronomic Engineering, Zootechnics and Veterinary Science Schools. The Law and Political Science Faculty is formed of the Schools of Law and Political Science Schools. The Law and Political Science Faculty award the titles of Licentiate in Law and Licentiate in Political Science; the latter has three majors: Internationals Studies, Socioeconomics Studies and Internationals Relationship. The Criminology Institute is a part of the Faculty. By Law 4412 of 24 March 1956 the University Organization Law of 21 October 1937 was modified, adding the Economics and Commerce Faculty to the existing faculties. The new faculty would award the degrees of Licentiate in Commercial Science and Doctor in Economics and Commercial Science. 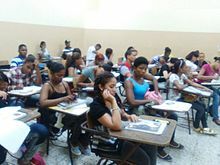 At the same time, Law 4413 decreed that the four courses "of the second cycle of the Superior School of Accountant Technician, established by the decree 2383... were assigned to the Economics and Commerce Faculty of the Santo Domingo University from 12 October 1956, under the name of Commercial Science Department". The Law 4439 dated 4 May 1956 changed the name of the "Economics and Commerce Faculty" to the "Economics, Finance and Commerce Faculty". This same law authorized to the graduates of the Superior School of Accountant Technician, with the title of Accountant Technician "provides them with licence to practice the profession of Authorized Public Accountant and carry the title in Commercial Science and allows them to opt for the Doctorate in Commercial Science by the presentation of a thesis, following the regulation dictated by the University Council". In 1960, Law 5130 changed the "Economics, Finance and Commerce Faculty" to the "Economic Science Faculty" and included the Public Administration School. The Organic statute approved by the University Cloister in 1966, gave the faculty with its current name of the "Economics and Social Sciences Faculty". Currently, the Economics and Social Sciences Faculty is formed of the Schools of Economics, Accountant, Statistics, Sociology, Marketing and Administration Schools. The Engineering and Architecture Faculty is formed of the Schools of Architecture, Electromechanics Engineering, Civil Engineering, Chemical Engineering, Surveying and Industrial Engineering Schools. The Science Faculty is constituted of the Schools of Biology, Geographic Science, Physics, Mathematics, Microbiology and Parasitology, Chemistry and Computing Schools. The Health Sciences Faculty formed of the Schools of Pharmacy, Imaging, Infirmary, Odontology, Bioanalysis, Medicine, Public Health, Nursing, Physiology and Morphology Schools. The Arts Faculty is formed of the Schools of Criticism and History of Art, Publicity, Theater, Music, Film, Television and Photography, Industrial Design and Fashion and Plastic Arts Schools. Educational vice-rector: Dr. Jorge Asjanna David. Vice-rector of Research and Postgraduates: Ma. Francisco Vegazoe. Administrative vice rector: Ma. Emma Polanko. Vice-rector of Extension: Ma. Francisco Terrero Galararza. ^ a b c "Historia" (in Spanish). Universidad Autónoma de Santo Domingo. Retrieved 11 February 2017. Wikimedia Commons has media related to Universidad Autónoma de Santo Domingo. This page was last edited on 12 April 2019, at 06:02 (UTC).